Cottage Paper: Happy Birthday to my Daughter! Today is the birthday of my daughter. I won't tell you how old she is - she wouldn't care if I did but then you would know how old I am! :-) When I saw the Painted Blooms Designer Series paper in real life I was struck by how gorgeous the flowers were! The pictures in the catalog and on the online store do not begin to do them justice! I am not a big flower person but as soon as I saw this paper I knew I wanted to use it on a card. Blackberry Bliss (a color you also have to see in real life to truly appreciate) is one of the colors in the Painted Blooms DSP and purple is one of my daughters favorite colors. It seemed like these products would be perfect for a birthday card for her. Here is the card I made. I used two of the Painted Blooms patterns - the roses and the leaves - on a Blackberry Bliss layer. I then cut a strip of Blackberry Bliss cardstock to cover the seam and used the Large Scallop Edgelit die to create a decorative edge along the bottom of the strip. I stamped the birthday sentiment using the Petite Pairs stamp set. I thought a square piece of cardstock would look best on the card but since the birthday sentiment did not fill the square I needed something to balance it. I tried Candy Dots but they overpowered the sentiment so I used tiny Rose Red dots punched out with the Owl Builder punch. For a final touch I lined the envelope with a piece of the pansy DSP (it is my favoand scalloped edge of both the paper and the envelope. 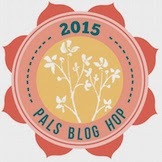 The next stop is Becky Volpp at inkblossomwithbecky.com on the Pals Blog Hop! Thanks for visiting and I hope to see you next month. Lovely use of this DSP and great use of the Owl Builder Punch. (1) Happy birthday to your daughter (2) great card! Love the use of colors and patterns (3) Love, love, love the use of the scallop edgelit on the envelope and coordinating liner - brilliant! I love the way you combined patterns. This is a sweet card! And, happy birthday to your daughter! Beautiful blooms for a sweet daughter. TFS! Gorgeous card for your daughter! I have been hoarding my pack....but you have inspired me to launch in and CASE your card for a very special birthday card for a sweet and dear friend! Thank you!